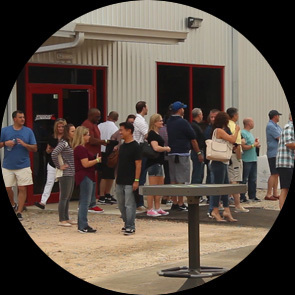 Speedsportz Racing Park, located just north of Houston in the Grand Texas Entertainment Park, is the ultimate party destination. Whether you are looking for the perfect venue for a birthday party, family reunion, bachelorette or bachelor party, end-of-summer bash, or just a place to get a few friends together - Houston's High Speed Playground has got what you need! 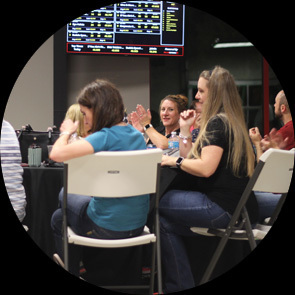 We can accommodate parties of 5 or more racers. Reserve seats for your party of 5 to 20 racers in advance then arrive 30 minutes prior to your scheduled race time for registration. Party Host receives a Free Race! Current prices are $25/one race, $45/two races and $60 for three. Happy Hour Pricing: Wednesday-Friday, 3pm-6pm Buy Two Races, Get One Free! All Racers must be at least 13 years old AND 60" tall. Read all of our race requirements on our Kart Rentals page. 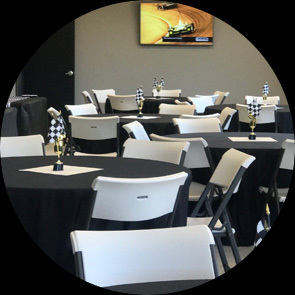 Contact us, at least one-week prior to your party, to schedule a Private Racing Party. We cater this one-hour event to fit your needs. $75 per racer is due in advance with a Minimum of 10 Racers. The overall winner of the race receives a Custom Speedsportz Trophy. Upgraded Party Room available for parties of 20 or more during party. Room charge before or after party is $75 per hour. We have a 250 square foot Party Room available for hourly rental which will accommodate groups up to 20. The Party Rental Rate is $75/hour and is payable in advance. Decorations are at your discretion. Let us create an event your group will love!